Sodastitch SO-3100 Cross Stitch Kit "Post Card"
Sodastitch SO-4101 Cross Stitch Kit "Bringing Up Happy"
Details : Kit consists of original color pattern printed by Sodastitch (Korea), color printed thread pallette, DMC floss, needle, 14 count Korean Aida cloth, and instruction. Design size is 63w x 75h. Sodastitch SO-4100 Cross Stitch Kit "A Conjugal Tie"
Sodastitch SO-499 Cross Stitch Kit "Propose On The Tree"
Details : Kit consists of original color pattern printed by Sodastitch (Korea), color printed thread pallette, DMC floss, needle, 14 count Korean Aida cloth, and instruction. Design size is 59w x 59h. 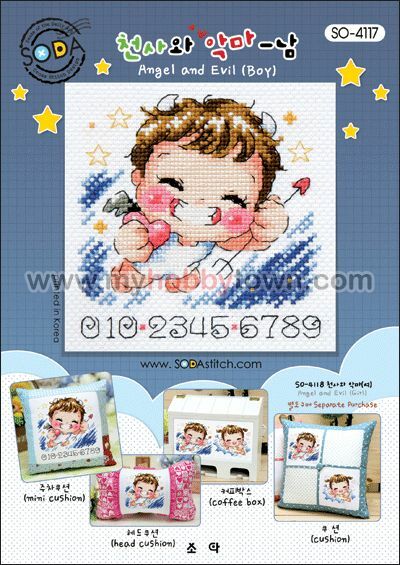 Sodastitch SO-494 Cross Stitch Kit "Sky Mate"
Details : Kit consists of original color pattern printed by Sodastitch (Korea), color printed thread pallette, DMC floss, needle, 14 count Korean Aida cloth, and instruction. Design size is 65w x 58h. Sodastitch SO-490 Cross Stitch Kit "A Swing In The Sky"
Sodastitch SO-464 Cross Stitch Kit "Throbbing Kiss"
Sodastitch SO-462 Cross Stitch Kit "Please Be My Star"
Details : Published by Sodastitch (Korea), A4 size, high quality print, original pattern. Design size is 58w x 58h.